The First Time. Every Time. Anywhere. 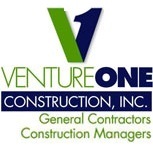 Venture One Construction provides general contracting and construction management services to a wide range of clients for projects throughout the Eastern United States. Our resume of projects include: Retail, Medical, Schools, Community, Municipal, and Restaurant. We are recognized for excellence in the Commercial Construction Industry. Venture One has been approved as a GC for Starbucks. We are looking forward to several bids in the coming weeks. If you are interested in bidding on future Starbucks project please send us an email, bidding@v1cinc.com. We will be doing both new construction fit-outs and full remodels. Venture One has received a rating of Excellent from Contractor Score LLC. To view our certification, Click Here.